If you are not Mexican or do not understand the celebration associated around the “Day of the Dead” you may be very confused if you arrive in Mexico during the time of this celebration. Originally in pre-Hispanic Mexico it was the day to celebrate the children and the dead. So, for you to understand completely it is better to explain that this is the day or days that Mexican families remember their family members that have passed away and the continuity of life. This is an ancient festivity that has been much transformed through the years, but which was intended in pre-Hispanic Mexico to celebrate children and the dead. Hence, the best way to describe this Mexican holiday is to say that it is a time when Mexican families remember their dead, and the continuation of life. 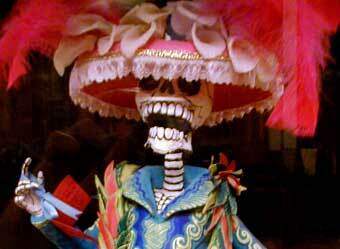 There are really two days which are celebrated for the “Day of the Dead” and they are November 1st and 2nd. This is the day that Mexican families welcome their dead back into their homes and they visit the graves of their departed family members. At the cemetery, the grave site is decorated with flowers and the entire family enjoys a picnic. Everyone who ventures by can enjoy the picnic as well. This is a time for the families to celebrate the souls of the dead loved ones returning to them. They are believed to be all around them and enjoying the picnic as well. The meals that are prepared are very exquisite including such dishes as spicy sauces, chocolate beverages, cookies, sugary confections usually in the shape of an animal or sometimes the shape of a skull. More than likely the graveside will be decorated with large and brightly colored flowers like marigolds and chrysanthemums. Also offerings are given to entice the loved ones to come back for this occasion such as the great food, cigarettes and alcoholic beverages. In the home, families create an altar. This altar is also decorated with items that are beautiful. Offerings are also given like flowers and food, but things that are closer to the loved one that has passed on like photographs, or even a favorite shirt or dress. Anything that the loved one cherished while alive can be used. This is a way for the loved one to find their way back and to enjoy the day with their family once again partaking in the things they loved while alive. Sometimes, the street is also lined with petals, from the street to the altar inside the home. November 1st is the day for remembering the departed children. This day is called the “Day of the Little Angel or “Dia de los Angelitos”. November 2nd is reserved for the adults that have passed on. In some families they now only observe November 2nd and it is called the Day of Dead in which a feast is prepared and served in the early morning hours. This can also be celebrated with a unique supper with the special bread called the “bread of the dead”. This “bread of the dead” is prepared by many families and chefs all over Mexico for this very special celebration. In southern Mexico, in a city by the name of Puebla, if you are the lucky one to bite into one of these rounded loaves of bread and bite into a plastic skeleton you will be blessed with good luck. Sugar skeletons and other items with death motifs are given to friends and family on this occasion and are considered very special prized gifts. In the area of Oaxaca, you will find this bread shaped into a body or burial wrap with a face embedded on the end of the loaf. Because of the demand for the “bread of the dead” during this time many bakeries halt production of other breads before and during the celebration of The Day of Dead. The Day of the Dead can be very important or just a social event according to the area of Mexico your are visiting. In large cities in Mexico it is mainly marked by special food and confections but in the more rural areas where they are still in tune with their own roots that are kept close to their hearts the celebration is major. The southern part of Mexico is still celebrating the Day of the Dead in its own unique and originality. On October 31, Mexican families prepare for All Saints Day or the Day of the Dead, which is November 1: a day to fondly remember those who have passed on. 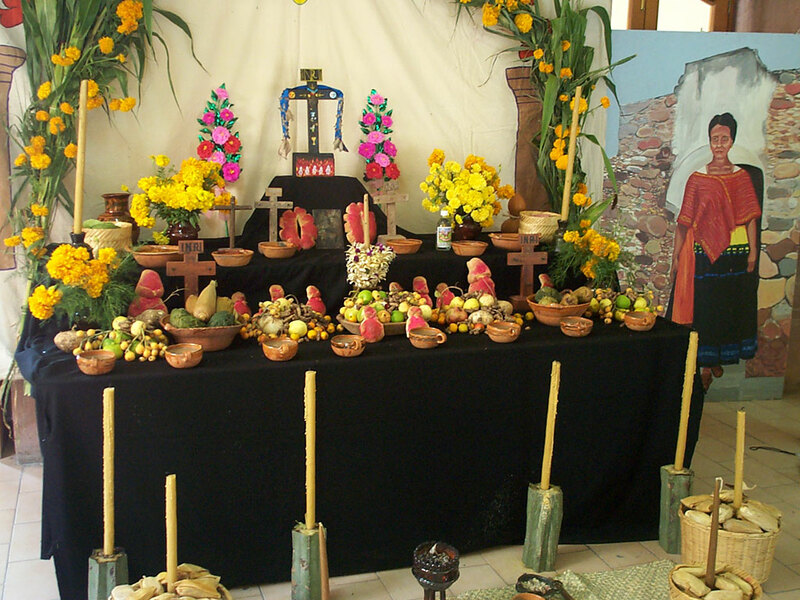 To honor the spirits of their relatives, families make colorful altars in their homes using caramels, flowers, photographs, candles, and favorite food and drinks of the departed ones. The altars are lit; cemeteries are cleaned up, graves are given fresh paint and flowers. Kids play with scary toys like skeletons and witch dolls, bought at markets filled with spooky knick-knacks. Before dinner, much like “trick-or-treating”, kids go out to request “calaveritas”: a gift of money or a skull-shaped candy. Special dinners include candies, apples, sweet rice with frijoles, sweet potatoes, and “dead bread” shaped like a skull. 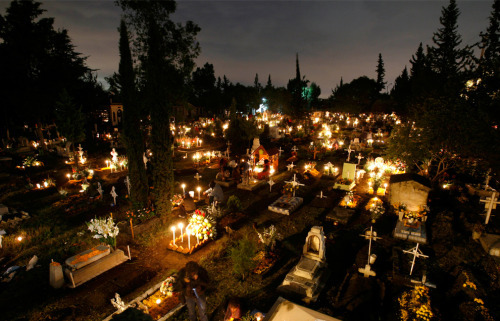 Also part of Day of the Dead: families congregate in the cemeteries to think about loved ones, not in somber gatherings but more like a party, often with a mariachi band and fireworks. In Playa del Carmen, the day finishes with an evening stroll in the shopping mall area. Local costumed artists on the street corners sing and dance. At Constitutiones Avenue and 5th Street, there’s a grand celebration in honor of the beloved dead. Reblogged this on Tulum Vacation Rental – Renta Vacacional Tulum.